Ms. Vesna Travljanin, the Director of the Association of Municipalities and Cities in the Federation of Bosnia and Herzegovina, and Mr. Aleksandar Bogdanovic, Mayor of the Royal Capital of Cetinje and President of the Governing Board of the Union of Municipalities of Montengero, represented NALAS in the European Policy Summit “Western Balkans at a Crossroads – New Challenges, Changing Dynamics”, held on 5 December 2017 in Brussels, Belgium. Ms. Travljanin and Mr. Bogdanovic took part in the panel "Think Local, Act Regional”, pointing out how the European Union can support local and regional cooperation in the countries of the Western Balkans, how decentralisation reforms could be ensured, and the role of local self-government and representatives of local self-government units be enhanced in the EU integration processes. “EU institutions should bear in mind the specificities of local and regional authorities as one tier of government and engage with local authorities in multi-stakeholder dialogues on issues related to EU integration and reform processes”, said Ms. Travljanin. “More inclusive consultation processes at all stages of planning, programming and decision-making on EU support instruments should take into account specific role, competences, tasks and responsibilities of local governments. NALAS strongly advocates to include the local government dimension in strategic and operational planning for EU enlargement”. Speaking about the role that local self-governments should have in the accession process, Mr. Bogdanović underlined that local self-governments should be involved as much as possible in the negotiating process, as well as in the work of all sectoral working groups and other working bodies and commissions that, at the central level, are formed for the European integration process. "The experience of recent EU members tells us that the preparation of local governments should not be neglected and postponed for the last stage of integration, because then there is not enough time for all preparatory activities and training of local officials for new duties. Only if the process of association is carried out at the national level in parallel with preparations at the local level, the necessary knowledge will be adequately and timely adopted at the local level", said Mr. Bogdanović. Speaking of how EU can help increase local cooperation in Western Balkan, Mr. Bogdanovic stressed that the first thing to do is to foster and support regional initiatives of local government associations. "EU should provide technical and financial support to regional networks of local governments and their associations, such as Network of Local Authorities of South East Europe - NALAS that gathers 15 associations from 12 countries. Other important thing to do is to provide local level niche in existing instruments of cooperation at the regional level such as RCC, ReSPA and Berlin Process which are currently focused mainly on the level of central governments, although the scope of their work should be applied at local level too", said Mr. Bogdanovic. In addition to the "Think Local, Act Regional" panel, two additional panels were held: "Peace, Democracy and Reconciliation" and "Business Outlook Perks Up but Reforms Must Continue". 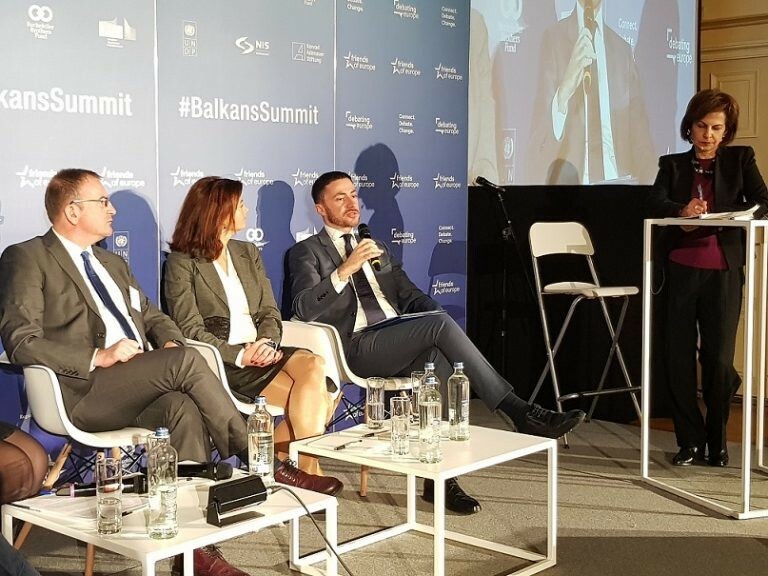 The Summit was attended by over 300 participants, representatives of the Western Balkan countries, and eminent international organizations and institutions. The Summit was organized in cooperation with the Konrad-Adenauer Stiftung and the United Nations Development Program (UNDP), with the support of the RCC and the European Commission DG NEAR by the Brussels leading think-tank “Friend of Europe”.